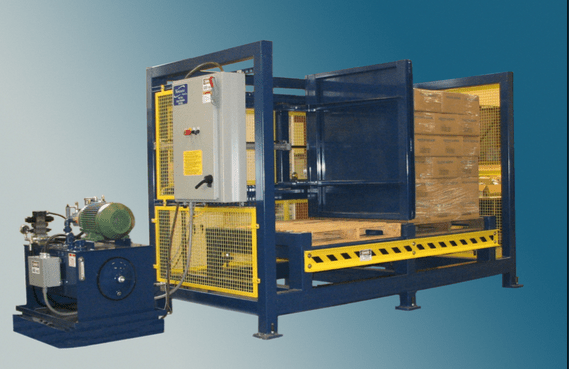 The RM-1150 is a basic and reliable system designed to transfer cases and combo boxes from one type of pallet to another for shipping, storage, or to meet in house production requirements. 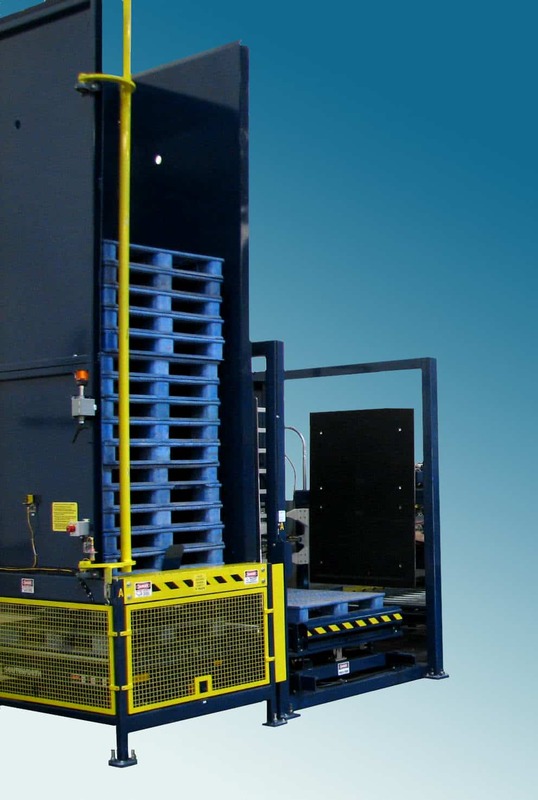 The system utilizes a pallet dispenser and stacker to minimize pallet handling. 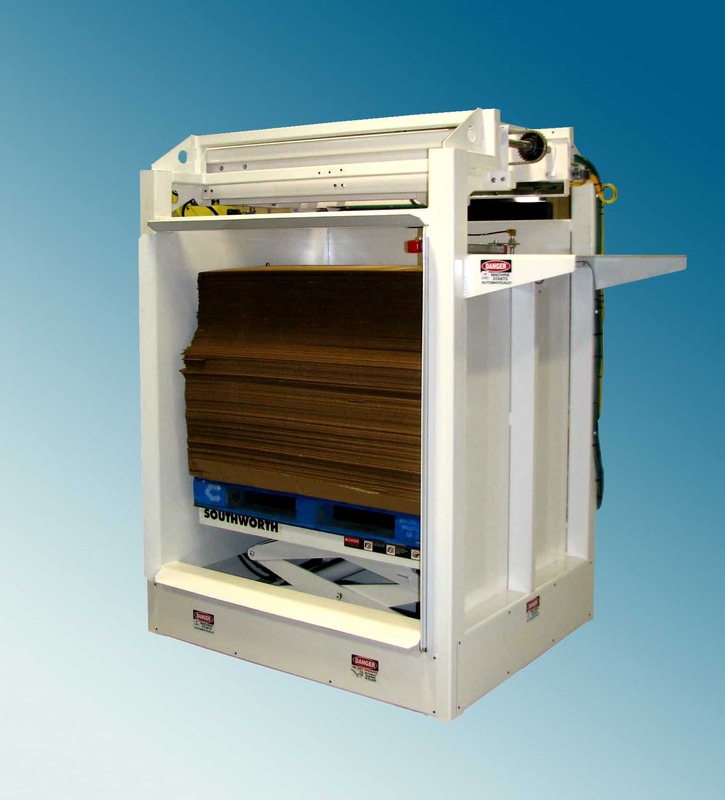 The RM-1000 is an automatic system for transferring product from a pallet to a slip sheet. Sheets are lifted, transferred, and clamped to receive cases from a wood in- house pallet. A hydraulic push plate then transfers the cases. Empty pallets are automatically stacked in a magazine for removal by fork truck. 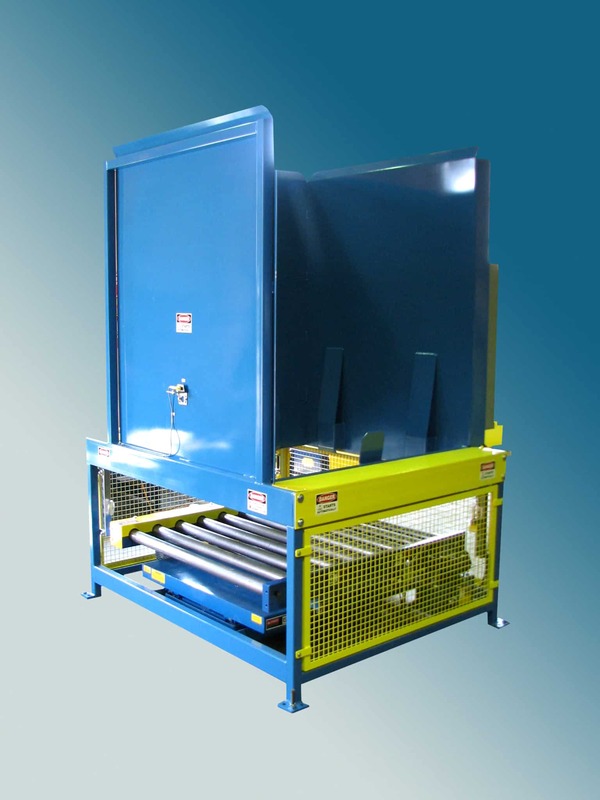 The RM-1350 is used to split double loads or transfer unitized product to pallets. 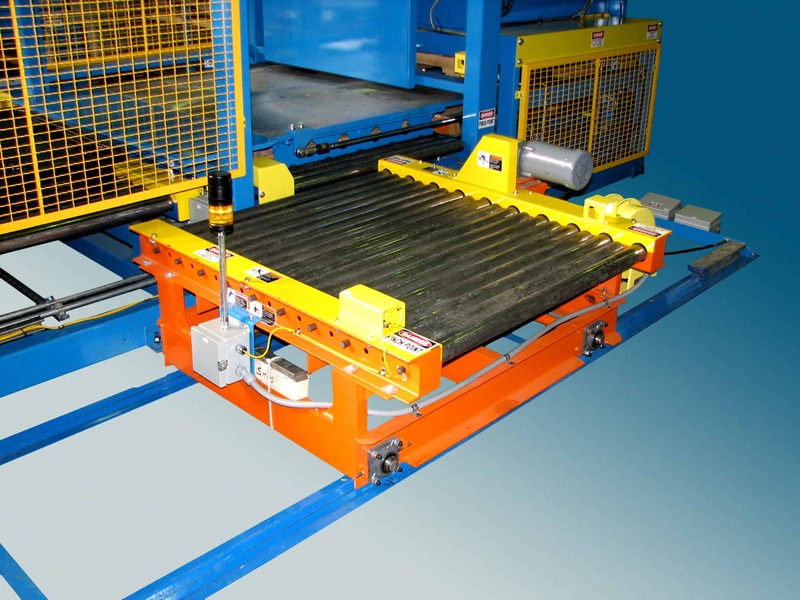 The RM-1750 automatically transfers product on a slip sheet from a pallet to a roller conveyor. A hydraulic push/pull attachment is then utilized to transfer the product. The LP-775 automatically stacks and transfers product to a pallet with hydraulic lifting tines. 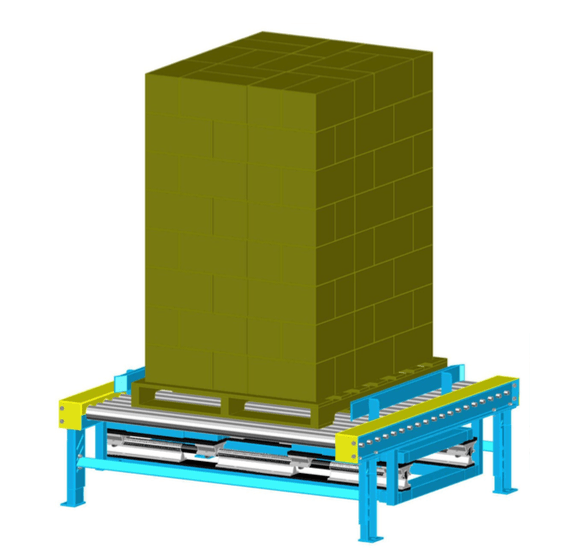 The Newcastle Load Stacking System is designed to automatically double stack full loads on pallets. The RM-1500 Stacker Crane is an economical alternative to a fork truck for repetitive material handling operations. Pallet loads weighing up to 4,000 lbs. can be transferred from the conveyor to the floor for handling with pallet jacks. Loads can also be double stacked. The 50-57 automatically dispenses pallets from a storage magazine. Pallets discharge inline to pallet magazine. The 50-57 automatically dispenses pallets from a storage magazine. Pallets discharge 90 degrees to pallet magazine. 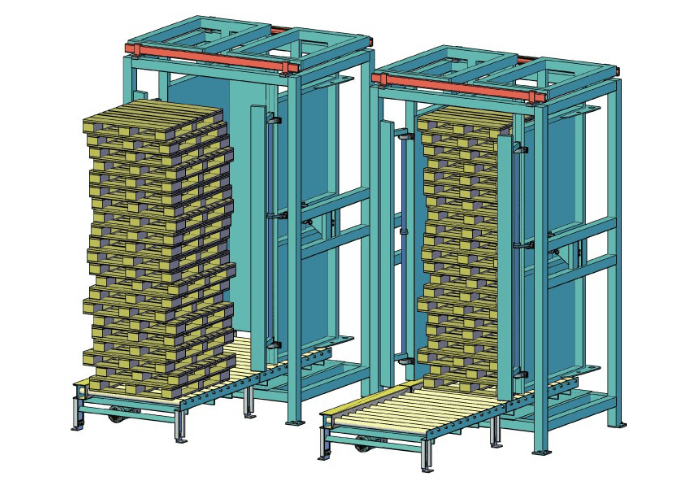 The 50-57 receives single pallets from customer infeed conveyor and automatically lifts and stores in a magazine. 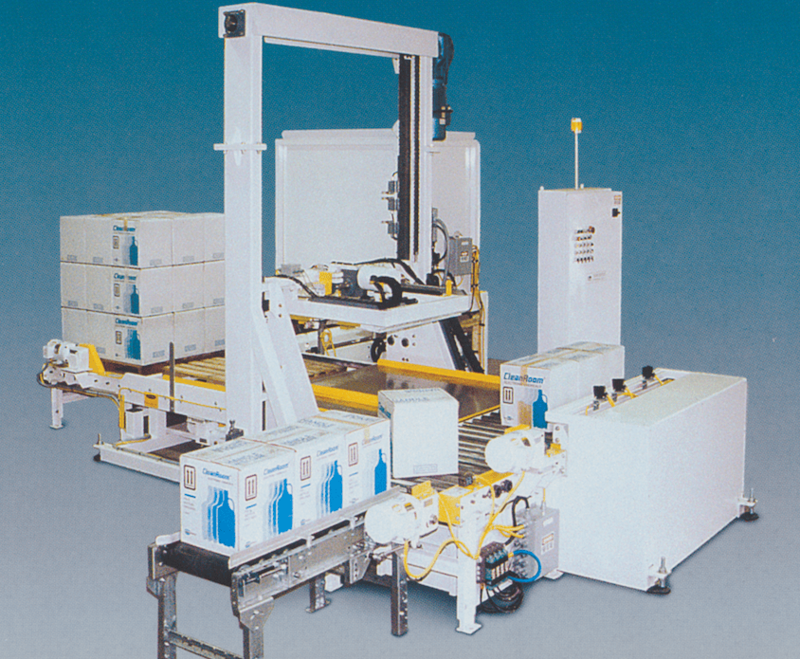 The Newcastle 50-57J is a fully automated, floor-level pallet dispenser and stacker. 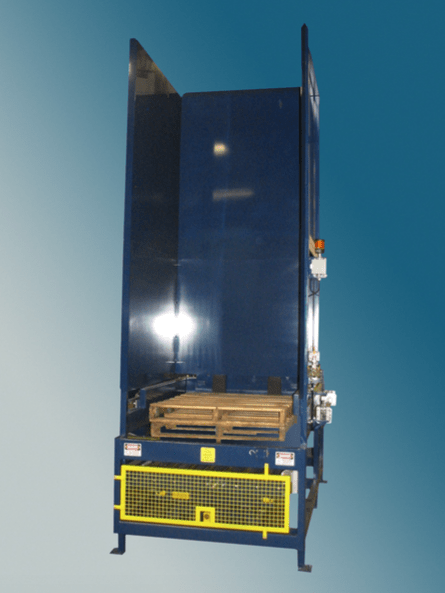 This unit can handle various pallet sizes and eliminates the physical handling of pallets. 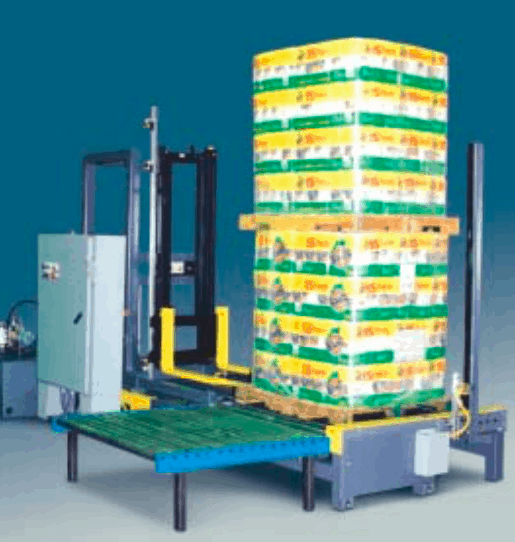 The Newcastle 50-57XJ is a fully automated, floor-level pallet dispenser and stacker. 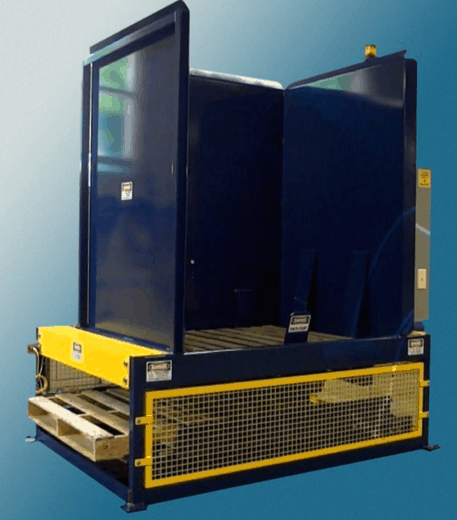 This unit can handle various pallet sizes and eliminates the physical handling of pallets. The Newcastle 50-57A is an adjustable dispenser designed to handle a range of pallet sizes. After setting the guides, a fork truck is used to load the magazine. The bottom pallet is removed with a set of holding bars and a hydraulic lift. The single pallet is then discharged with a powered conveyor installed in the dispenser. The 50-57 automatically dispenses pallets from a storage magazine. Unit discharges pallets 90 degrees to magazine loading. 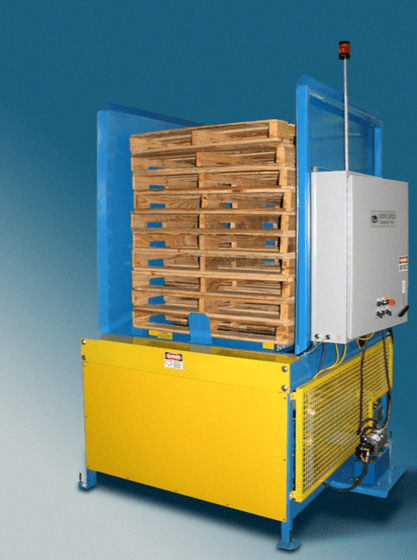 The 50-57 automatically dispenses oversized pallets from a storage magazine. Unit discharges pallets 90 degrees to magazine loading. 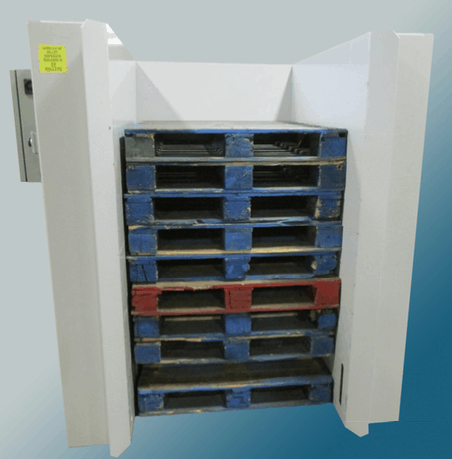 The 50-57 automatically dispenses pallets from a storage magazine. 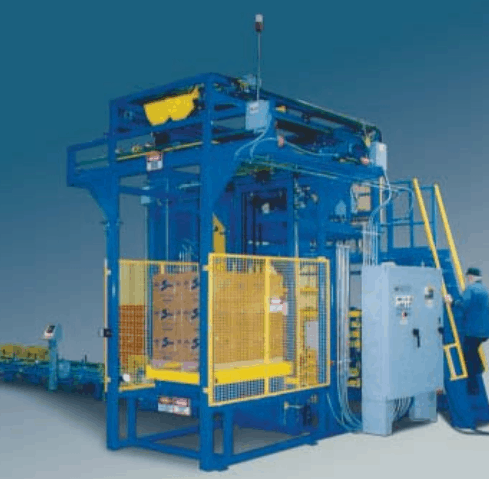 Unit will discharge pallets 90 degrees from magazine loading. 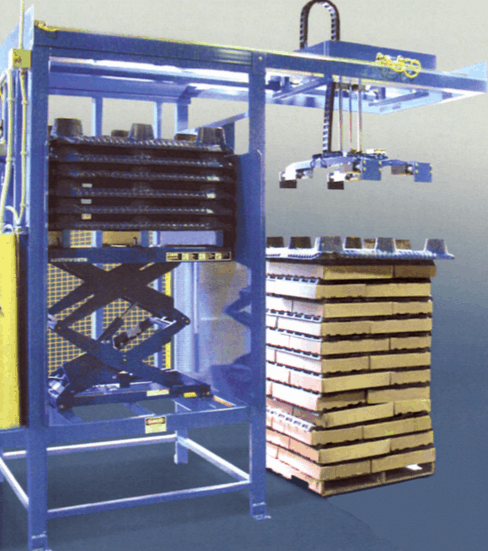 The 50-57-2 automatically dispenses pallets from storage magazines. Pallets discharge 90 degrees to pallet magazine. 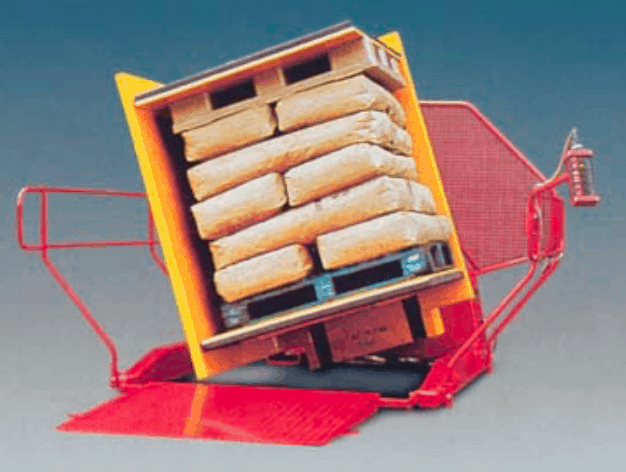 The 50-57-3 automatically dispense pallets from storage magazines. 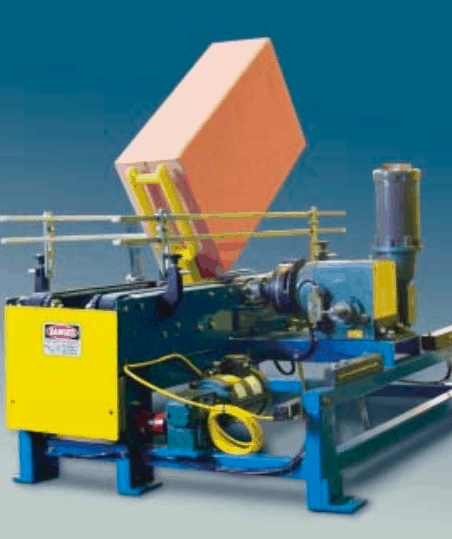 Pallets also have option to receive a single slip sheet from RM-975 Sheet Dispenser. 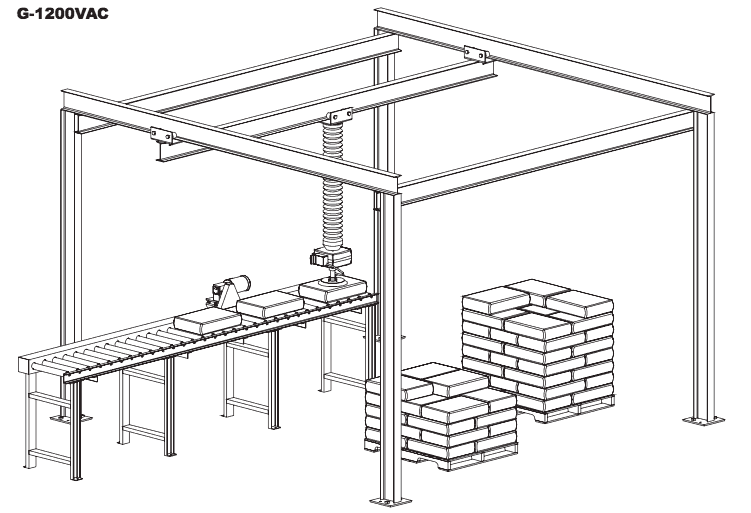 The 40-57 is utilized to manually stack and discharge pallets. 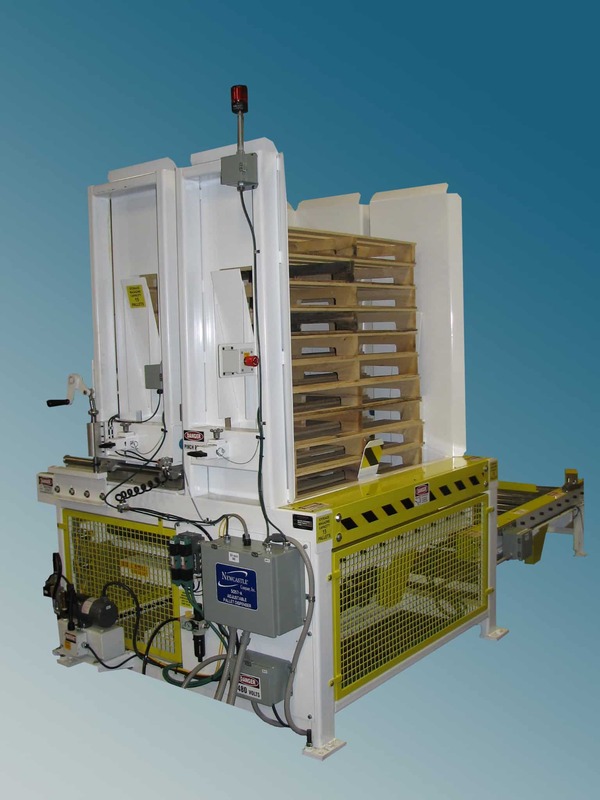 The Newcastle RM-975 automatically dispenses sheets or captive boards for palletizing or load transferring operations. 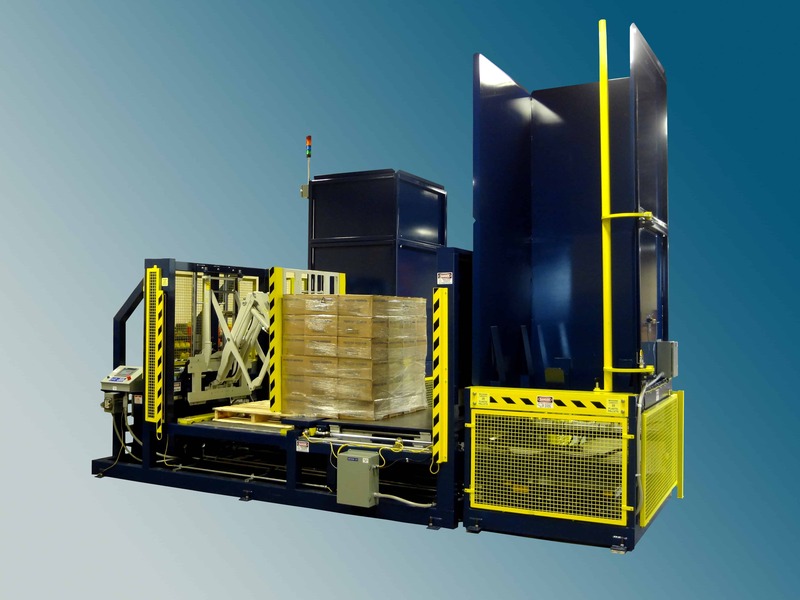 The RM-985 automatically dispenses sheets for palletizing or load transfer operations. The RM-995 utilizes four clamp assemblies to secure the edges of pallet or board. 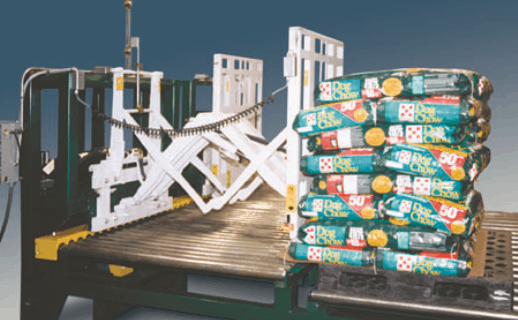 Guided cylinders installed on motorized carriage then lifts and transfers the pallets to the main line conveyor. 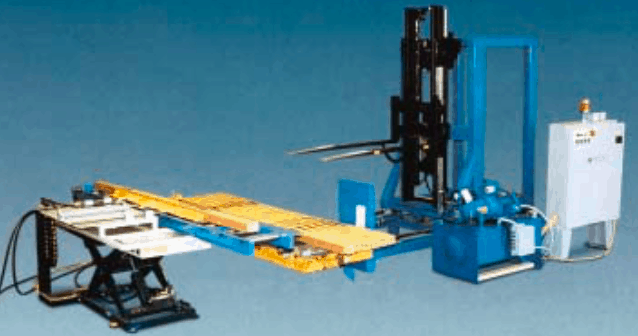 The Newcastle LP-2000 is designed to square palletized cases prior to entering the automated storage retrieval system. 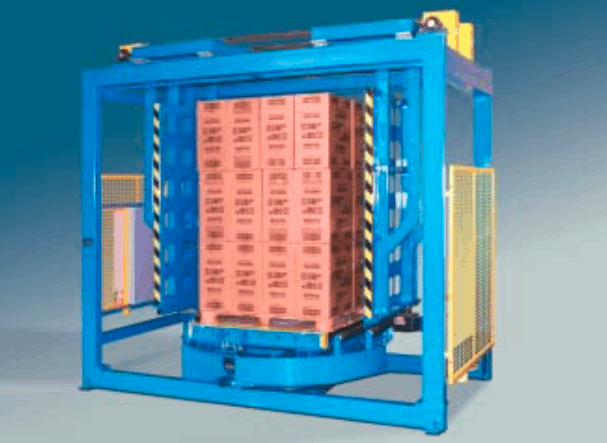 The LP-3000 is designed to square stacks of pallets prior to entering or exiting an automated system. The LCD-200 Load Centering Device includes a roller conveyor section and dual pusher plate assembly. The pusher plate assembly moves along guided rails and is driven by hydraulic cylinders. Device can be installed within an existing controller or built with a stand alone unit. 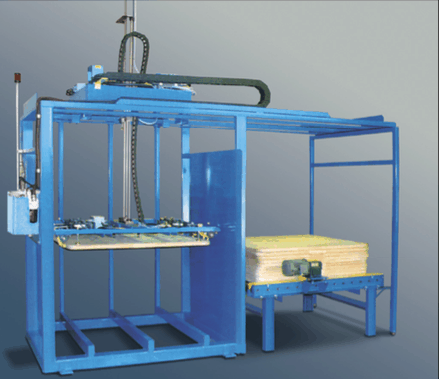 The Newcastle Pallet Straightener is a heavy duty steel magazine used to straighten and store stacks of pallets. 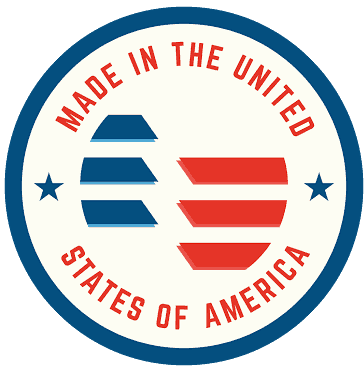 Each Pallet Straightener is custom built to meet the customer’s specifications. The 100-57A is fully automatic and operates at floor level. It handles trays and cases at speeds up to 20 cases per minute. The 100-57A has been designed for single line, low volume operation. 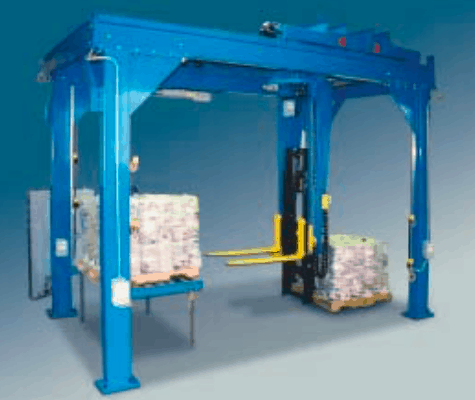 The 100-57B is designed to automatically palletize full bags onto a pallet or slip sheet. Operations are performed at floor level. Up to ten bags per minute can be handled. 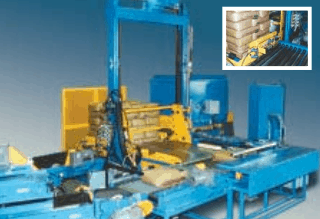 Description The 100-57SA is a fully automatic, medium speed palletizer. It handles trays and cases at speeds up to 25 cases per minute. The 100-57SA is flexible, handling a wide range of case patterns. 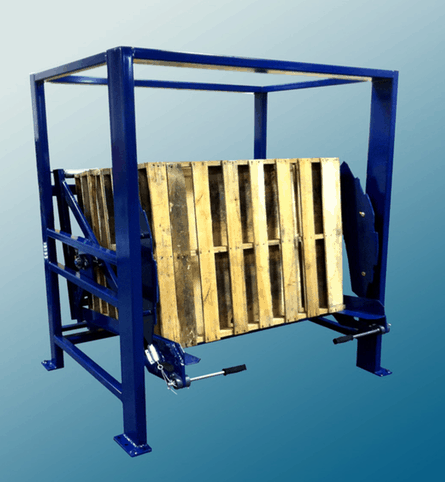 The model 100-57D is designed to automatically palletize full drums onto a wood pallet or plastic pallet. 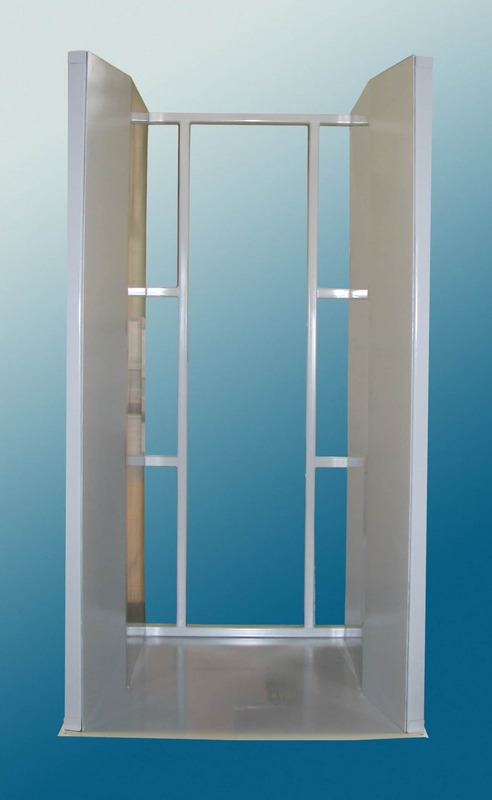 Several models are available to suit most applications. This system handles 55 gallon drums at a rate of four (4) drums per minute. Drums are transferred from an infeed conveyor to a stripper plate that retracts and deposits drums on pallet. 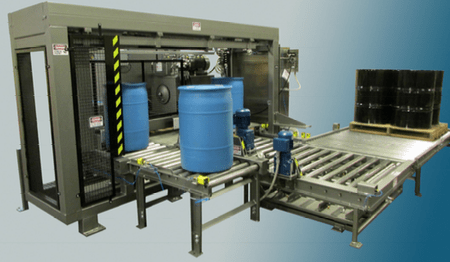 This totally hydraulic system includes a pallet dispenser, drum palletizer, drum infeed conveyor, and a full pallet discharge conveyor. 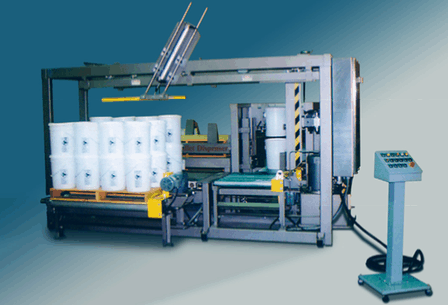 The model 100-57P Automatic Pail Palletizer stacks and palletizes plastic or metal pails. Unit has been designed as a maintenance free system. 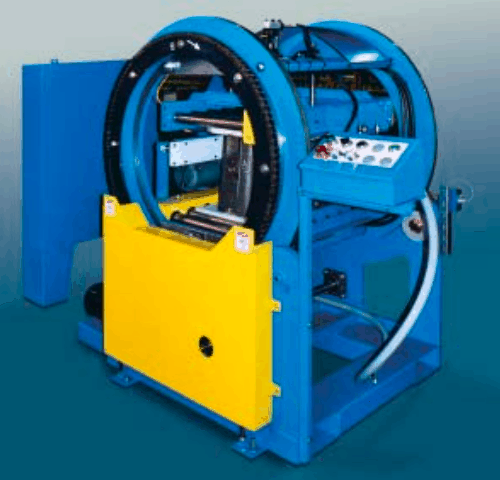 The equipment is hydraulically operated and utilizes standard readily available components. 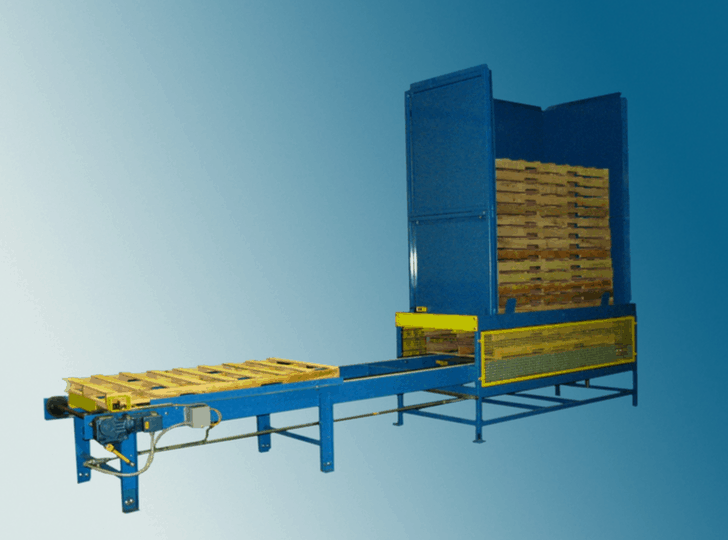 Loads are easily transferred from wood pallet to plastic pallet, slip sheet or rental pallet, as well as to and from rental pallets automatically. This type of automation reduces the need for manpower and significantly decreases the potential for back injury. 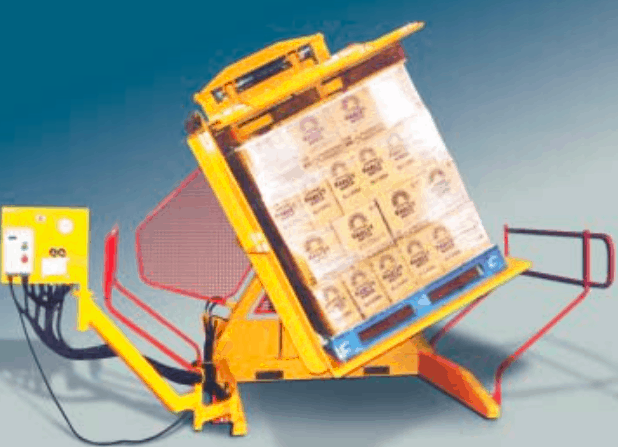 In addition, safety rails and guards that don’t hinder the efficient removal of broken or damaged product are standard features on Newcastle Pallet Inverters. This model also offers control options that range from standard pendant controls to fully automated systems. The pendant control allows easy access to lift truck operator. 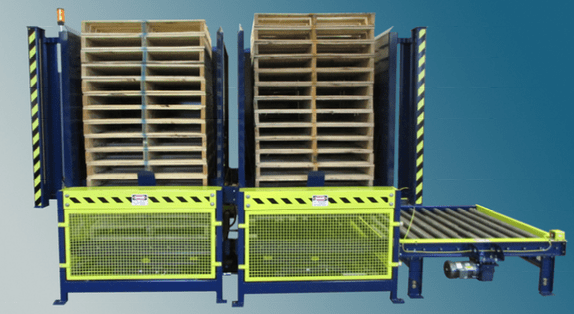 The Newcastle Model FDL transfers loads from wood to plastic pallets, slip sheets or rental pallets and allows for easy removal of damaged product from the bottom of a load. It also helps save costly in-house pallets. 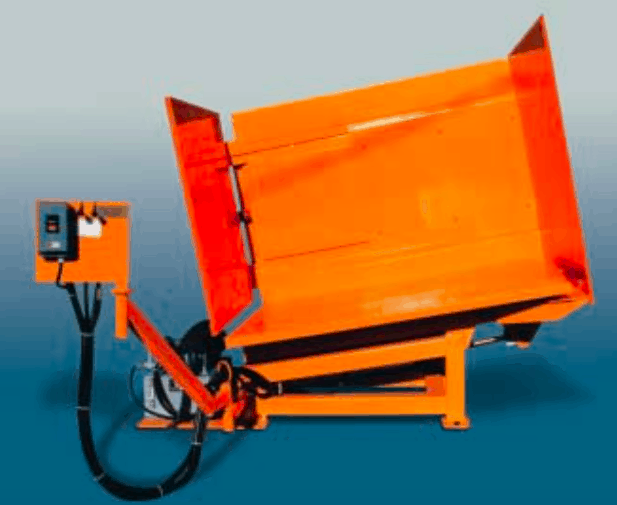 The tapered bucket style of the clamping plates on the FDL allows for simple entry and exit from the machine and permits loading via pallet jack or lift truck. 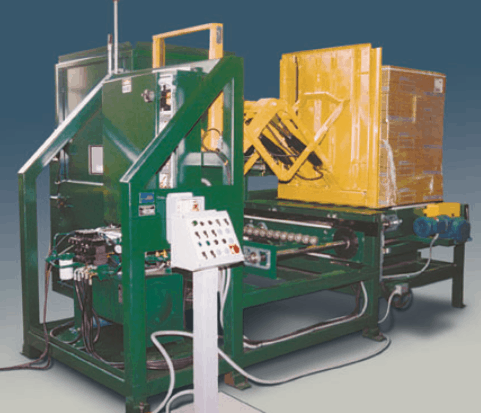 The Pallet/Spacer Recovery System is a labor saving spacer and pallet removal machine. It is built to take the rugged treatment of meat processing and freezing operations and is ideal for simple pallet replacement and recovery of freezer separators. 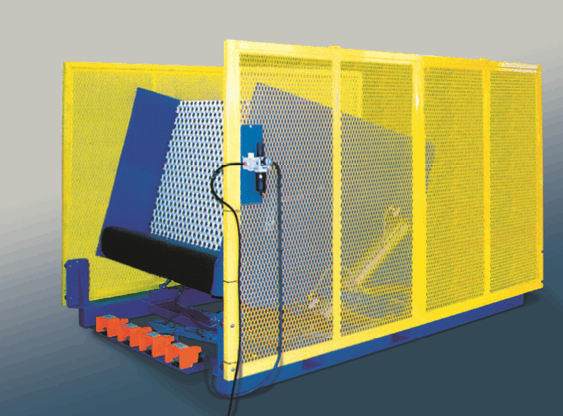 The product requiring 180 degree inverting is received by the inverter conveyor and positioned in the unit. The clamp assembly secures the load and the product is inverted. The conveyor then discharges the load onto the customer’s conveyor. The material is handled safely, while also eliminating damage. The clamp pressure can be adjusted, depending on the type of materials being handled. Sensors in the inverter align the product. The W-550 Transfer car moves product from loading and unloading stations and between conveyor lines. 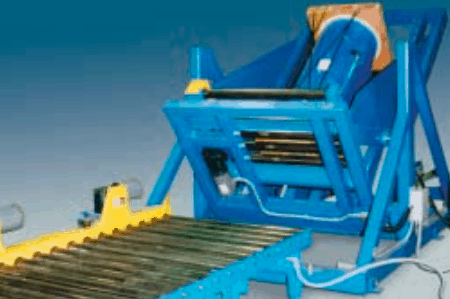 Power roller or drag chain conveyor decks transfer pallets in different configurations. Optional scissor lift allows for infeed and discharge at different elevations depending on requirements. Power transmission and control are accomplished through a cable carrier, wire rope festoon, rail festoon or spring wound drum. Many different configurations are available. 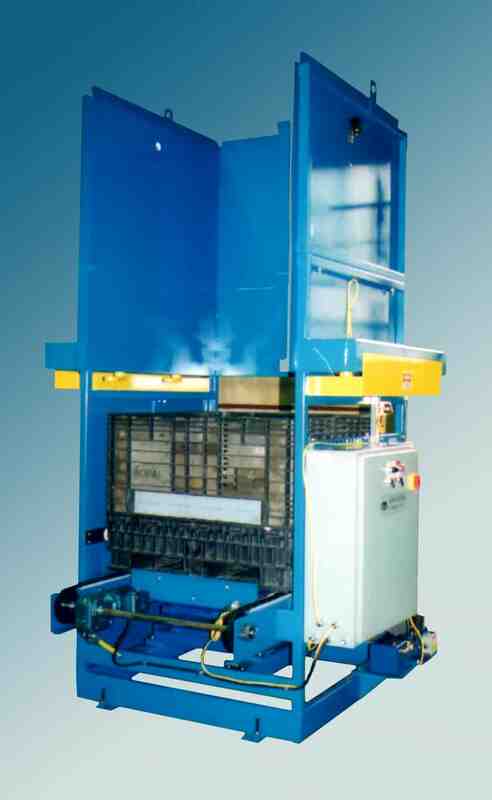 The Model 100-57GB is fully automatic and performs pallet loading at floor level. Long cases with fluorescent tubes, construction materials, etc. can be placed on a pallet, slip sheet or cart. Pallet dispenser, sheet dispenser and conveyors are available as options. 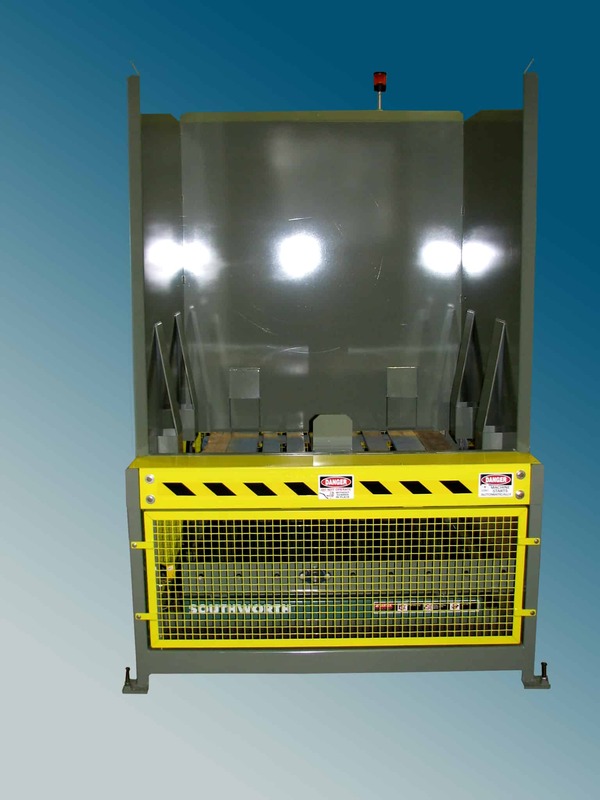 The RM-1360 is used to stack and destack open or closed containers, handling up to four (4) containers per minute. 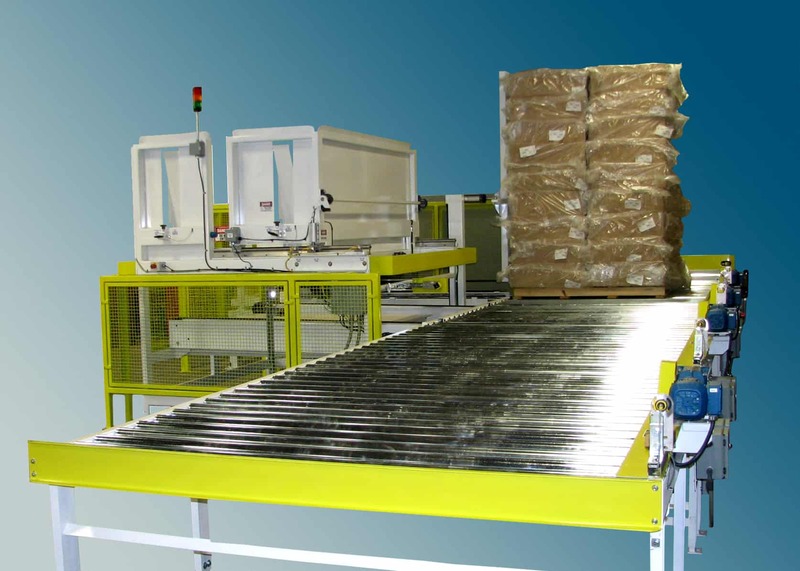 A powered conveyor transports single pallets through a wash rinse and blowoff system. 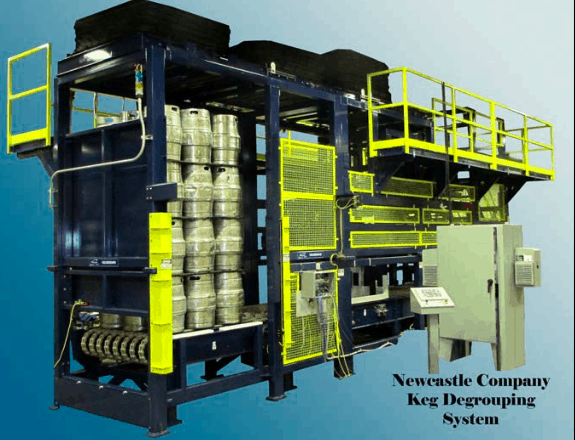 The Newcastle Keg Degrouping system automatically forms single layers of keg from a full palletized load. Keg boards are automatically stacked and staged for removal. The G-1200VAC is a Vacuum Lifter with interchangeable pads for nonporous and semi-porous loads. The system can be mounted to a jib crane or over- head gantry. 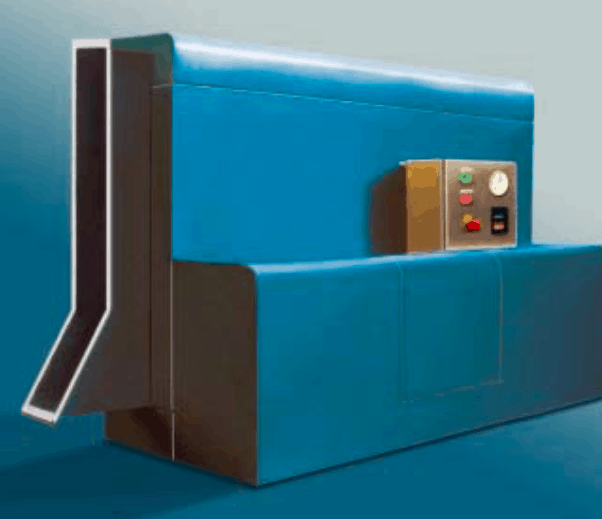 The Model G-795 is utilized for in-line case handling. Cases are automatically up-ended for labeling and palletizing. Infeed metering conveyors and discharge conveyors are available to interface with existing equipment if required. 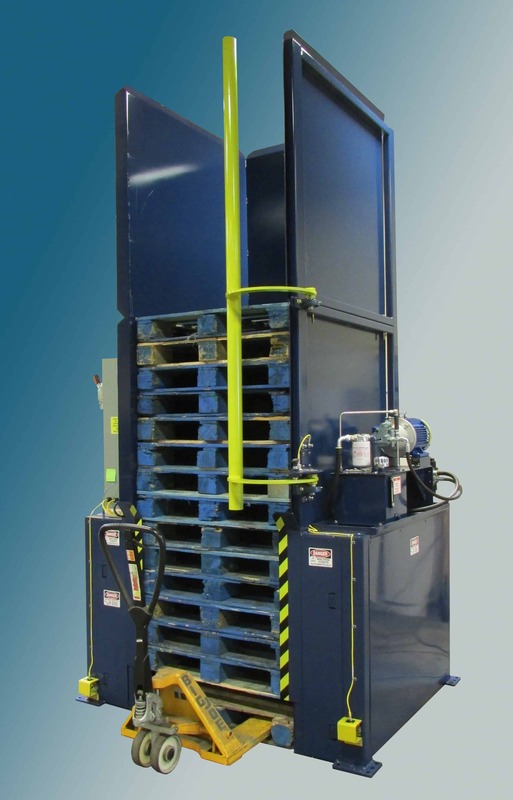 Upending, downending or positioning rolls and other types of loads is safe and efficient with this 90 degree hydraulic upender. Your browser did not support the HTML5 Videos.